(Ashland, OR) — This year’s Talent Harvest Festival will feature Oregon’s first solar farm beer. Caldera Brewing is delighted to introduce a new collaboration, “Let’s Bee Friends IPA,” that uses honey harvested from a pollinator-friendly solar farm near Medford. Unlike many solar sites, this one features perennial flowering native plants under and around the panels which meaningfully benefit honey bees and other pollinators, as well as holding the soil on site and improving it over time. “Let’s Bee Friends IPA” will be first available at the Talent Harvest Festival and then in the Caldera Brewery & Restaurant in Ashland. greater use of clean energy, introduced Old Sol Apiaries to Pine Gate Renewables. “While the upfront cost to revegetate with pollinator-friendly natives is more than the turf commonly seen on solar farms, we expect to see long-term savings over the life of the project based on reduced maintenance costs realized through the efficiencies of native species,” said Julianne Wooten, environmental manager for Pine Gate Renewables. “It is encouraging that more and more people are recognizing the agricultural, ecological, and economic benefits of establishing flowering and low-growing meadows under and around solar arrays. 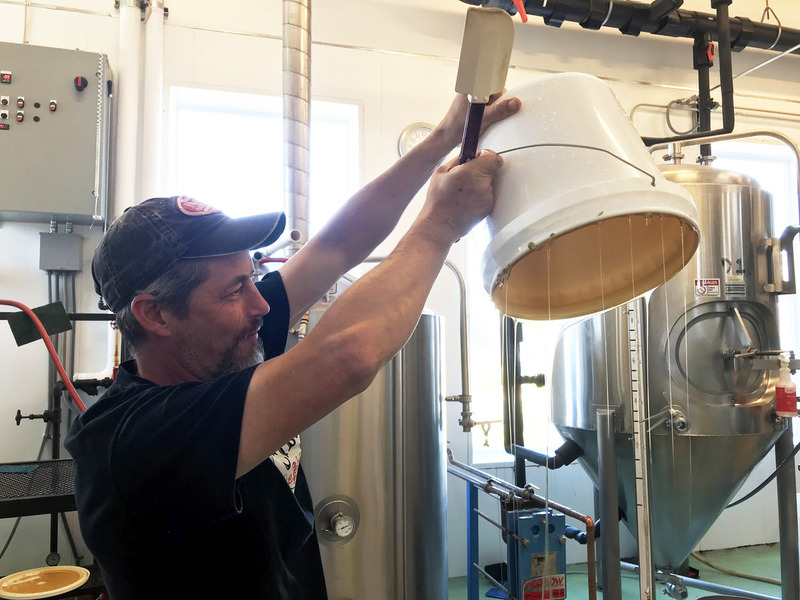 Caldera Brewing’s new beer provides another opportunity for local interests to find common ground,” said Rob Davis, director of the Center for Pollinators in Energy at Fresh Energy. Statewide Oregon has more than 15 million acres of agricultural land and uses more than 300,000 acres to grow turfgrass seed. The United States Department of Agriculture National Conservation Resources Service (NRCS) reports that erosion rates on Oregon cropland have fallen from an average of 5.3 tons per acre per year in 1982 to 3.8 tons of topsoil loss per acre per year in 2007. Perennial native vegetation, like that being established by Pine Gate Renewables on its Oregon solar farms, holds topsoil on site and has deep root structures that break up compaction and add soil organic matter over the life of the project. Climate and soil scientists expect that the increasing intensity of storms and rainfall events will result in significantly higher topsoil losses on cropland without perennial vegetation. Despite a national goal of stabilizing annual honey bee losses at 15 percent of hives, Bee Informed Partnership reports that Oregon beekeepers lost 35 percent of hives from April 2017 through March 2018. According to USDA National Agricultural Statistics Service, Oregon had more than 110,000 hives during this time and thus more than 38,000 honey bee hives died statewide. Creating acres of healthy habitat on solar sites, roadsides, and other managed landscapes has been identified as one of the leading strategies to improve overall pollinator health. Science & Technology, identified more than 16,300 acres of pollinator-dependent crops close to 204 megawatts of solar arrays throughout Oregon. Very cool and innovative concept!!! I love it!! !